Is Your Driver's License a Real ID? Your State Driver's licenses may not be accepted for Domestic US Air Travel in January. The Department of Homeland Security is slowly raising the security requirements of our regular drivers licenses in the United States as part of their Real ID program. Some states have recently received an extension, but others have not and their grace period expires January 22, 2018. If you have a driver's license from those states, you will need a passport or other enhanced ID to fly even on a US Domestic only flight. See where your state stands and get more information on the Homeland Security website at https://www.dhs.gov/real-id. The Laptop ban on flights to the US has officially ended. There was speculation of expanding the ban. Instead, airlines and airports have adopted more stringent screening protocols and are using more sophisticated scanning equipment. Homeland Security says there are now no airlines under restrictions for large personal electronic devices. The Transportation Security Agency (TSA) has lifted the restrictions on large personal electronic devices for the ten airports/nine airlines in the Middle East and North Africa, which were announced in March. These airports and airlines have also successfully implemented the first phase of enhanced security measures. Received a wonderful report from one of our group clients about their recent trip to Honduras. "Got back in last night and had a great trip. No problem. Just a few things that we did. Over 10 accept the Lord!" Praise the Lord for these hard workers! US Homeland Security has updated their fact sheet on the Large Electronics Ban. They have expanded the information with some Q&As. You can read it below or follow this link. One of the consequences of this is that if you are connecting through one of the affected airports, you will need to place any large personal electronic devices in their checked bags upon check-in at their originating airport. Emirates has made a special work around for their passengers connecting through Dubai. They will collect your larger electronic devices at the Dubai boarding gate and return them to you on arrival in the US. More about that on the Emirates website. Q1: Why is the U.S. Government taking these steps now? Are these new policies in response to a specific terrorist threat or plot? A1: The U.S. Government is concerned about terrorists' ongoing interest in targeting commercial aviation, including transportation hubs over the past two years, as evidenced by the 2015 airliner downing in Egypt, the 2016 attempted airliner downing in Somalia, and the 2016 armed attacks against airports in Brussels and Istanbul. Evaluated intelligence indicates that terrorist groups continue to target commercial aviation, to include smuggling explosive devices in various consumer items. Based on this trend, the Transportation Security Administration (TSA), in consultation with relevant Departments and Agencies, has determined it is prudent to enhance security, to include airport security procedures for passengers at certain last point of departure airports to the United States. These enhancements include more stringent measures applied to 10 specific airports. This security enhancement will be implemented through a Security Directive (SD)/Emergency Amendment (EA) process, which includes industry notification, to affected air carriers that will implement the requirements. Q2: Why is DHS/TSA doing this now? A2: The Department of Homeland Security, in close cooperation with our intelligence community partners, continuously assesses and evaluates the threat environment. While a number of existing security measures remain in place, others will be modified, as deemed necessary to protect travelers. DHS will continue to adjust its security measures to ensure the highest levels of aviation security without unnecessary disruption to travelers. Q5: How did you select these airports and which ones are affected? A5: DHS, in close cooperation with our intelligence community partners, selected these airports based on the current threat picture. The affected overseas airports are: Queen Alia International Airport (AMM), Cairo International Airport (CAI), Ataturk International Airport (IST), King Abdul-Aziz International Airport (JED), King Khalid International Airport (RUH), Kuwait International Airport (KWI), Mohammed V Airport (CMN), Hamad International Airport (DOH), Dubai International Airport (DXB), and Abu Dhabi International Airport (AUH). Abu Dhabi, United Arab Emirates - Abu Dhabi International Airport (AUH). Q6: Could more airports be added in the future, and might some of those be in the U.S.? A6: As threats change, so too will TSA’s security requirements. Q7: How long will these new procedures remain in place? A7: The new procedures remain in place until the threat changes. These are risk-based decisions and TSA continuously assesses security risks and seeks to balance necessary security requirements with their operational impact on the industry. Q8: Why won’t these procedures continue indefinitely, like the prohibition on bringing liquids through security screening? A9: The size and shape of smart phones varies by brand. Smartphones are commonly available around the world and their size is well understood by most passengers who fly internationally. Please check with your airline if you are not sure whether your smartphone is impacted. Q10: Why does this only apply to large electronic devices? Why doesn’t this apply to mobile phones? A10: TSA seeks to balance risk with impacts to the traveling public and has determined that cell phones and smart phones will be allowed in accessible property at this time. Q11: Is air travel safe? In combination, these layers provide enhanced security creating a much stronger and protected transportation system for the traveling public. TSA continually assesses and evaluates the current threat environment and adjusts security measures as necessary to ensure the highest levels of aviation security without unnecessary disruption to travelers. Q12: How will TSA ensure foreign airports and air carriers are complying with the new procedures? A12: TSA conducts assessments of foreign airports and inspections of airlines to ensure all U.S. regulations and International security standards are being met at last point of departures to the United States. TSA directly assesses the security posture of last points of departure airports under the Foreign Airport Assessment Program (FAAP) and evaluates the implementation of the internationally recognized International Civil Aviation Organization (ICAO) standards. TSA also utilizes its regulatory authorities over the air carriers which serve the United States to implement enhanced security measures at foreign locations. As an element of each air carrier’s legally binding approval to operate to and from the United States, the airline agrees to meet all security requirements stipulated by TSA. Q16: Does TSA have to hire additional officers, or transfer some to the affected airports, to ensure the new screening procedures are followed? A16: No additional TSA personnel are needed because TSA does not conduct screening at airports outside the United Sates. Q17: Are the security measures introduced on July 2, 2014 still in place? A17: A number of those implemented security measures remain in place while others may be modified as deemed necessary to protect travelers. Since July 2, 2014, a number of foreign governments have themselves enhanced aviation security, buttressing and replacing our own measures at these airports when it became routine at overseas airports for security officials to ask some passengers to turn on their electronic devices, including cell phones, before boarding flights to the United States. Q18: How many flights does this affect? A18: This will only impact flights from 10 of the more than 250 airports that serve as last points of departure to the United States. This will only impact a small percentage of flights to the United States. The exact number of flights will vary on a day to day basis. Q19: How many passengers will be affected? A19: These measures will apply to all passengers on flights from the 10 last points of departure airports, a small fraction of passengers traveling to the United States by air each day. Q20: Will this affect passengers enrolled in trusted traveler programs? A20: These measures will apply to all passengers on flights from certain locations regardless of trusted traveler status. Q21: What do you recommend passengers do if they are flying out of one of the last point of departure airports? A21: Passengers should pack large personal electronic devices in checked bags and contact their air carrier with additional questions. Q22: How will this affect the screening process at the airport? A22: Generally, passengers will be instructed to place large electronic devices in their checked bags when traveling from one of the last point of departure airports. We provided guidance to the airlines who will determine how to implement and inform their passengers. Q23: How will this affect passengers with connections? A23: TSA recommends passengers transferring at one of the 10 affected airports place any large personal electronic devices in their checked bags upon check-in at their originating airport. Q24: Can you provide any examples of recent terrorist plotting against the aviation sector? Please highlight the trend you’re concerned about. A24: Although the U.S. has instituted robust aviation security measures since 9/11, our information indicates that terrorist groups’ efforts to execute an attack against the aviation sector are intensifying given that aviation attacks provide an opportunity to cause mass casualties and inflict significant economic damage, as well as generate overwhelming media coverage. We note that disseminated propaganda from various terrorist groups is encouraging attacks on aviation, to include tactics to circumvent aviation security. Terrorist propaganda has highlighted the attacks against aircraft in Egypt with a soda can packed with explosives in October 2015, and in Somalia using an explosives-laden laptop in February 2016. Terrorists have historically tried to hide explosives in shoes in 2001, use liquid explosives in 2006, and conceal explosives in printers in 2010 and suicide devices in underwear in 2009 and 2012. Within the last year, we have also seen attacks conducted at airports to include in Brussels and Istanbul. Q25: How were these countries informed? A25: USG officials coordinated with their foreign counterparts to inform them of the changing threat. TSA has a formal process for notifying airlines through the EA/SD process. This process was used to notify affected airlines of the needed changes. Q26: How will this be implemented? A26: The Airlines will have 96 hours to implement. The manner of an EA/SD is to tell an airline the end result required (no electronic devices larger than a cell phone allowed in the cabin) and allow them the flexibility to implement within their business model. Q27: Will U.S. direct hires/diplomats posted in these countries be told to take other routes/airlines? A27: No. U.S. government employees in the affected countries have the option, but are not required, to modify their travel routes. The new routes must comply with all U.S. government travel regulations. Q28: Will this apply to flights departure to affected countries? A28: No. At this time, evaluated intelligence says that the threat exists at the 10 last point of departure airports. Q29: Does this start tomorrow? A29: Airlines were notified on March 21st at 3:00 a.m. EDT. They have 96 hours within which to comply. Q30: How long will these enhanced security measures be in effect? A30: These measures will be in effect indefinitely. However, DHS and TSA continue to evaluate our aviation security processes and policies based on the most recent intelligence. Q31: What will happen to my checked bag with my electronic devices once I land in the United States? A31: TSA will increase explosives detection screening of passenger luggage on select international inbound flights upon domestic arrival. The screening will occur prior to releasing the luggage back to passengers. It is possible that this process may result in delays for connecting luggage. Q32: Once I arrive in the U.S. and retrieve my bag, what if I miss my connecting flight to my final U.S. destination? A32: Contact your connecting airline on how best to rebook to your final U.S. destination. Additionally, consider contacting your airline prior to your flight to inquire about your connection time. Q33: What U.S. domestic airports will be impacted? A33: Atlanta (ATL), Boston (BOS), Chicago O’Hare (ORD), Dallas-Ft. Worth (DFW), Ft. Lauderdale (FLL), Houston Intercontinental (IAH), Los Angeles (LAX), Miami (MIA), Orlando (MCO), New York Kennedy (JFK), Philadelphia (PHL), San Francisco (SFO), Seattle-Tacoma (SEA), and Washington Dulles (IAD). Q34: What do I do if my electronics are damaged or missing from my baggage when I arrive at my destination? A34: Regardless of where you are flying to/from or what airline you are flying on, you should always contact your airline if there is an issue with your checked baggage. 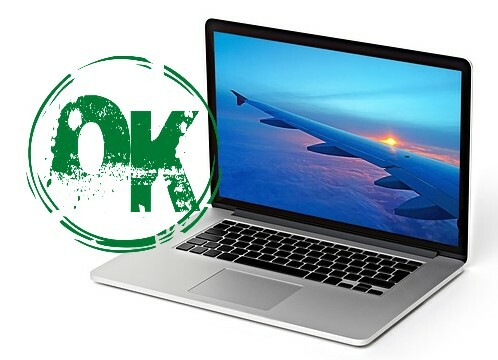 Q35: Are U.S. government employees who are assigned U.S. government laptops also restricted from carrying their laptops in carry-on bags on these flights? A35: The limits on the size of electronics in carry-on bags apply to all passengers, including U.S. government employees with U.S. government-issued laptops. Q36: What is the procedure if something screens positive for explosives? A36: TSA partners with local law enforcement officials at each airport and has protocols in place for proper response when a bag triggers an alarm during screening. Homeland Security has released a fact sheet on the Electronics Ban. To clarify, we've included the City Names for the airports below. The aviation security enhancements will include requiring that all personal electronic devices larger than a cell phone or smart phone be placed in checked baggage at 10 airports where flights are departing for the United States. 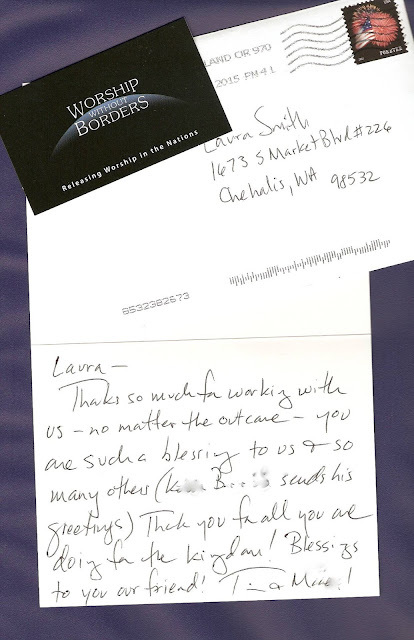 Got a nice thank you note from our friends at Worship Without Borders. Check them out! We love thank you notes. We love cute Thank you notes! We are not affiliated with All the World Travel of Florida.